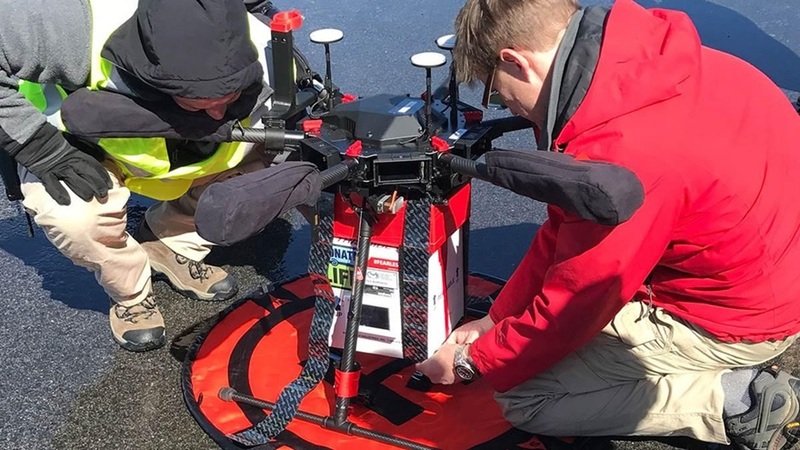 The technology of donor organ transportation took a revolutionary step forward in April 2018 when the University of Maryland held a series of test flights using an unmanned aircraft. The results of research flights, which were held on the university’s UAS Test Site, demonstrate what could potentially transform how organs are transported to those in need and the efficiency and security with which they are handled. The first test took place under clear skies and calm winds, which allowed the on-site team to make the flights relatively routine. The team choose a DJI M600 hexacopter, a DJI aircraft that Macatawa Unmanned can provide, and developed an electronic remote monitoring system, otherwise known as the Human Organ Monitoring and Quality Assessment Apparatus for Long-Distance Travel, or Homal for short. This system enabled the team to monitor temperature, vibration, and the organ’s GPS location during flight. Data from Hamal confirmed that the organ was not damaged during its round trip flight to and from St. Mary’s County Regional Airport in Maryland. The longest of the flights lasted about 12 minutes and extended to just beyond the airport property. The team test flew the aircraft fitted with an empty insulated cooler and monitoring system to prepare for the organ’s arrival. The test flight also confirmed that the sensor package developed by Dr. Joseph Scalea, a transplant surgeon of the University of Maryland, would not interfere with the aircraft controls. In situations such as these, the timely arrival of an organ is vital to the success of the mission. Transplant teams have very little time from the moment an organ is taken from a living donor and each passing minute reduces the health and viability of the organ. In short, any sort of delay has a very negative impact on the recipient’s quality of life. Unmanned aircraft technology can become the key link in a logistics problem, states Dr. Joseph Scalea following the tests. He estimates that the use of unmanned drones could save thousands of lives and improve the quality of life for those receiving donated organs by reducing the time of transport and as well as the damage that the organ could receive during the time between harvest and implantation. Although there are many regulations which debilitate certain uses of unmanned transportation, the hope for future transportation flights is to develop the technology to the point that the flight will include operations in controlled airspace and beyond the visual line of sight. Matt Scassero, director of UAS test center, states that they hope to seek FAA approval to fly over people, e.g. in densely populated urban areas. All in all, however, there is much hope for the future advancement of this type of technology. As a company committed to enhancing the security of businesses and government agencies, as well as general public safety, Macatawa Unmanned Systems is encouraged to see how its technology will help not only to facilitate the work of medical teams but to save and improve lives.